THANH-LONG Restaurant and Bakery is situated directly across the street from the Pio Stop. Along with its easy accessibility, this Vietnamese restaurant has the advantage of serving both to-go food and sit-down meals; students can choose between picking up a quick spring roll to-go or sitting down for a full meal likely consisting of Thanh-Long’s famed pho. Smaller dishes such as spring rolls have a price range of $4-$7, while pho is typically priced between $9 and $11. Formerly a food cart on SW College and 4th, Phat Cart expanded in 2016 to fill its own restaurant space adjacent to the food cart district it previously occupied. Phat Cart’s menu can be described as asian fusion, serving Thai, Japanese, Hawaiian, Indian and other cuisines in the form of bento bowls and sandwiches. Prices range between $7 and $9. Visiting the restaurant one afternoon, I ordered the “Mr. Miyagi Sandwich,” while my dining partner ordered the “Vegan Bento.” We were served at a swift pace and were delighted with the results: a meal both aesthetically-pleasing and delicious. Our only complaint was the lack of options for vegans. The atmosphere of Phat Cart is not indicative of that of an asian restaurant. Decorations include planted succulents covering the two long tables, bulbed lights strung across the room and eclectic artwork hanging on the walls: decorations more typical of a “hip” coffee shop than a asian fusion restaurant. Nonetheless, with the addition of patio seating perfect for a sunny day, Phat Cart’s atmosphere is trendy and well-suited for your typical Portland foodie. The Portland Soup Company food cart is plopped smack dab in the middle of a sea of Asian and Indian food carts on SW College and 4th. With its quaint window planes and flower boxes resembling those of a house, Portland Soup Company has character that the surrounding food carts lack. It serves a variety of seasonal soups, salads and sandwiches, providing a quick to-go meal. The cart currently prides itself on its “Red Lentil Dal” and “Roasted Tomato Reggiano” soups, characteristic of the fall season; additionally, soups are always served with a piece of a freshly baked baguette. In my experience at the Portland Soup Company, I was surprised to find that their menu did not have as many soup options I would expect a “soup company” to have. However, the exceptionally-high quality of the soup I ordered, the “Red Lentil Dal,” made up for this fact. Considering I only paid $4 for an uncharacteristically-large cup of soup, I felt as though I got more than enough “bang for my buck.” Portland Soup Company’s entire menu has a price range of $4-$7, making it one of the cheapest food carts on the block. Originally operating out of a food cart on NW 23rd, acai bowl and smoothie shop “Moberi” recently opened a second location adjacent to the PSU campus on SW and 5th. It claims the title of “the original bike-powered superfood bar.” This refers to the bikes customers have the option to blend their own smoothies on: a feature that helped give the original location its fame. Moberi has a regular menu featuring acai bowls with a variety of toppings (granola, fresh berries, coconut, etc. ), along with smoothies: berry, green and protein-based. The price range is typically between $7 and $9, although the seasonal specials can be a bit spendier. I splurged and ordered the fall special: a pumpkin acai bowl with almond butter and cinnamon sprinklings on top. When my food arrived, I found Moberi excels in presentation, producing an acai bowl straight off of a vegan Instagram account. I was entirely satisfied with my meal, until my stomach started growling an hour and a half later. An acai bowl from Moberi may be aesthetically-pleasing, however, it does not take the place of a full meal; it is more of a healthy snack or a light breakfast. Rivaling Thanh-Long Restaurant and Bakery as its next-door neighbor, Baan Thai Restaurant and Bar is also located across from the Pio Stop. The restaurant’s space used to be limited to the upstairs of the building, with a coffee shop occupying the downstairs. 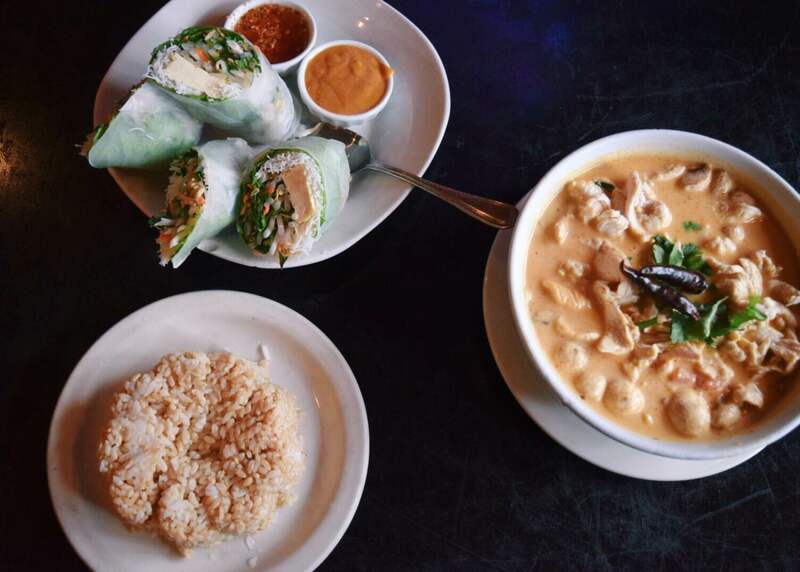 In 2013, Baan Thai expanded to fill the entire building and the popular coffee shop closed, much to the disappointment of the over-caffeinated PSU students. In response to the students’ negative reactions, Baan Thai has strived to provide a similar atmosphere to that of the coffee shop, giving students a place to do homework and relax. An attempt can be seen to fulfill this goal through Baan Thai’s calming lighting, jazzy music and tasteful decorations. Yet this goal has not been accomplished due to the atmosphere the restaurant’s bar has created, making the restaurant feel more like a pub than a coffee shop. I found the yellow curry I ordered to be mediocre and the chicken I paid extra for undercooked. With an average price range of $11-$17, I felt like I paid too much for the meal I was served. I left Baan Thai feeling as though I could have bought a higher-quality meal for a much lower price from one of the many thai food carts a mere block away.